This is how I feel right now. It's all about kombucha. I am absolutely crazyabout it. It is my go-to drink. I have blogged about it from time to time and have gotten a fair number of friends hooked on it, too. It is not a drug (ha, ha) but rather a fizzy, tasty drink with health benefits (so I guess in some senses it acts like a drug)! Kombucha is a fermented drink, born from a symbiotic colony of bacteria and yeast (SCOBY). Its roots go back about 2000 years, but it is VERY 2016. You can buy it at a store in a glass 16-oz. container (at Whole Foods, Trader Joes, and even Safeway), or you can try brewing your own at home! Here’s my attempt. I’m just starting out. Don't judge. Last fall I had the privilege of meeting Hannah Crum, the "Kombucha Mamma," at the Wise Traditions conference in Anaheim, California. There, I got the chance to pick her brain to learn more about this alluring drink known as the "immortal health elixir!" She told me about its history, benefits, and how to get started making my own! If you want to learn what all the hype is about, listen to this 30-minute interview, the Kombucha Craze. Or just go out and buy a bottle. Once you try it, you’ll understand why so many are raving about it. Still unsure about trying it? Check out some of its healing properties below! K- Kicks cancer – Studies have shown that glucaric acid (found in kombucha) has cancer-fighting properties. O – Oh, the weight you’ll lose! Kombucha speeds your metabolism and improves gut health. M– Makes your immune system strong. It is rich in anti-oxidents which boost immune systems and help prevent colds, flus, etc. B – Boosts your energy with enzymes and vitamins; brings balance to your gut's bacteria. U – Unique nutrients such as acetic acid, enzymes, and polyphenols improve your body's functioning. C– Cleanses and assists with detoxing the body, through gluconic acid and probiotics. H – Helps the digestive system (populating your gut with needed probiotics). A – Arthritis can be warded off and joint pain eased by the glucosamines in the drink. So join the KOMBUCHA craze! And drink a toast to your health with this unusual but uber-beneficial all-natural fermented drink! Yogurt and I didn't "meet cute" but now we're enjoying our "happily ever after"
You know how couples "meet cute" in the movies? Yogurt and I did not meet cute. The first yogurt I met was very plain and lumpy and sour. Not impressive. Kind of blah. So, yeah, zero chemistry. No chance of ever hooking up. When I got older and had kids, they seemed to like yogurt. I indulged them by buying unnaturally pink (or bright blue) yogurt in plastic tubes decorated with happy animated animals. This was "cute," alright, and great for them (or so I thought till I discovered how much sugar was in each tube) but I still couldn't swallow the idea of a real relationship with yogurt of my own. I knew deep down that yogurt had some health benefits, but I was fuzzy on the details. And I still hadn't met "Mr. Right." Yogurt is packed with probiotics (live bacteria) that are "good guys" in the micro biome of our bodies. Here's the back story: scientists say that we are crawling with bacteria, viruses, fungi, and other microorganisms that live on and in us and that they play a vital part in keeping our bodies well. These millions of organisms (yes, millions!) defend us from infections, even creating their own antibiotics to fight off attacking organisms. They strengthen our immune systems. They even help regulate our metabolisms, the energy we burn, and the fat we store. But not all of the organisms are good. Some are, but some are also bad, and some are neutral. What we need to do is shore up the good guys by eating plenty of foods with live, active cultures and enzymes. Say "hello" to yogurt---chock-full of the "good guy" bacteria that our bodies need. But, what if, like me, you've never been a yogurt fan? kimchi - a spicy traditional Korean side dish, made of vegetables and seasonings kefir - a fermented milk drink, originally from Russia, made from kefir grains sauerkraut - finely chopped fermented cabbage, from Germany curtido - dubbed "Salvadoran sauerkraut," a salsa-like condiment from Latin America kombucha - an ancient fermented Chinese tea miso or nato - traditional Japanese fermented soybeans pickles or pickled beets - cucumbers (or beets) soured by fermentation (Check your brands and look for those that have genuinely been fermented. 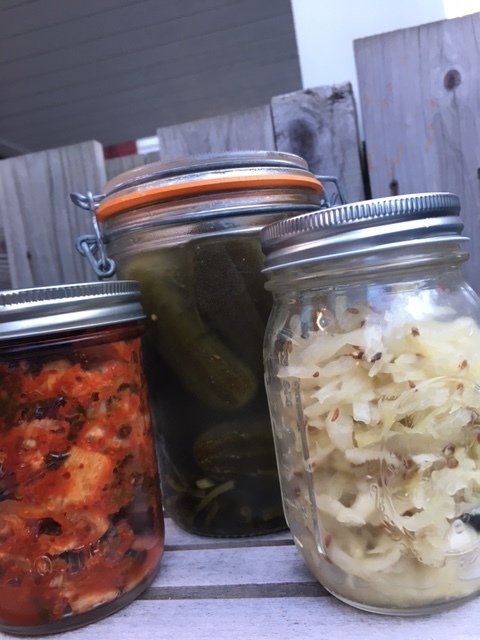 Some pickles and sauerkraut and such haven't been fermented. They are prepared only using vinegar.) yogurt from a farm - It may be that the supermarket brands are too processed for your taste. I recommend finding alternatives from local farms, often available at farmers markets. I get yogurt smoothies from a farm in Pennsylvania that are sweetened with raw honey or genuine maple syrup. They also add a little cream. Bingo! I went from "blech" to "yum" with yogurt. Do you enjoy a fermented food that didn't make my list? Please comment below! And make sure to tell me about your relationship with yogurt. Did you "meet cute" by any chance?